Journalist-memoirist Hochschild (Finding the Trapdoor, 1997, etc.) 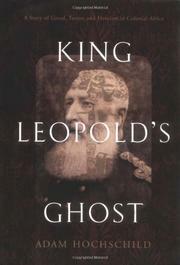 recounts the crimes against humanity of Belgium’s King Leopold II, whose brutal imperialist regime sparked the creation of Joseph Conrad’s Heart of Darkness and the first major human-rights protest movement of this century. Hell-bent on building grandiose state monuments and palaces and on swelling royal coffers, Leopold sought to carve out of central Africa a fiefdom 76 times the size of Belgium. Cagily inveighing against local slave traders and inviting Christian missionaries to spread the Gospel, he transformed a philanthropic organization temporarily under his aegis into the Congo, his own personal colony. He plundered the Congo’s bounty of rubber, instituted forced labor, and reduced the population by half (an estimated 10 million deaths from 1880 to 1920). To achieve compliance with rubber-gathering quotas, soldiers in the Force Publique, Leopold’s colonial army, committed mass murder, cut off hands, severed heads, took hostages, and burnt villages. His misrule remained undetected for more than a decade because he won US recognition of his claim to the Congo, used explorer Henry Morton Stanley to swindle chiefs out of land, and concealed the colony’s budget. If Hochschild depicts Leopold not as a Hitleresque madman but as a liberal bogeyman ready to sacrifice all for the bottom line, he profiles the monarch’s opponents in all their complicated humanity. These include George Washington William, an African-American journalist prone to exaggerating his own credentials but not Leopold’s atrocities; Roger Casement, a British consul knighted for a damning Congo report, then later executed for participating in Ireland’s 1916 rebellion, and exposed as a homosexual; and E.D. Morel, a journalist who, though committed to imperialism, led a decade-long campaign that succeeded in forcing Leopold to turn the Congo over to the citizens of Belgium. A searing history of evil and the heroes who exposed it.